New technologies have a powerful influence on all aspects of our society, from commerce and business to health and entertainment. Obviously, education is not an exception. Many technologies have an impact on the way we teach and learn. For example, new mobile devices (e.g., smartphones and tablets) raise student engagement in both indoor and outdoor activities with applications such as mobile augmented reality. New motion sensors and image-recognition technologies are giving rise to applications with more natural interaction methods, helping non-technical users to interact with computer-based systems, as in the case of new-generation video consoles. In addition, social networks and web 2.0 tools give students a more active role in their own education, allowing them to become educational “prosumers” (i.e., both producers and consumers). Education improvements do not necessarily have to be driven by technological developments. However, there is an increasing interest of researchers on using new technologies to improve education. This paper analyzes the technologies most likely to impact education in the near future, by looking at technology meta-trends from 2004 to 2014. This work is designed to provide a tool for researchers in education technologies, identifying the most important technologies in this arena in the past, present and near future. As such, it may help them to decide where to focus their research efforts. 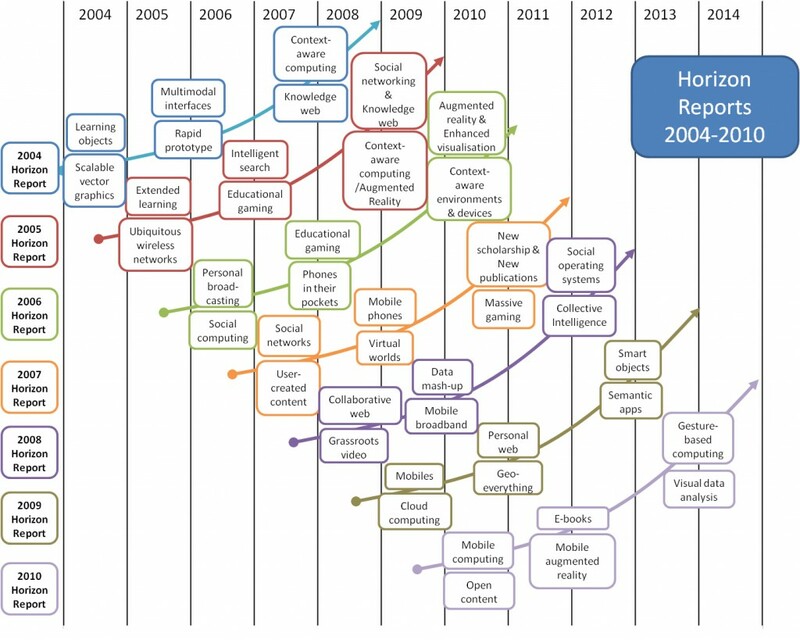 We used the predictions from 2004 to 2010 (i.e., from seven Horizon Reports), which cover the period 2004-2014, to analyze the technologies that have impacted education in the past or are likely to have an impact in the future. The analysis was carried out using these reports, as they are among the most widely used in education, and no other source of similar data has issued annual reports for a longer period of time. As such, these are the only predictions that allow a temporal comparison that reveals technological meta-trends. These reports are very referenced and cited, but no previous metatrends analysis has been conducted using the predictions from these reports. View more presentations from semagu.